As of this session, the game is now being played in AD&D 2nd Edition. [Evening] More than three dozen soldiers attend the meeting at Windless' mustering grounds, as does their captain, Calehan Longstrider. Longstrider agrees to dispatch a troop fifty strong to Frostmar Keep at sunrise. [Sunrise] The PCs travel with Captain Longstrider and his militia throughout the day. [Evening] The party arrives at the keep and enters its rear courtyard. After a small, eight-man militia patrol brings word of a goblin attack and single death a short way out, the keep is approached by Skelt-gash, the Burning Orc chieftain, and nearly two score of underlings. A tense but non-hostile parlay reveals the orcs' intention for Frostmar Keep to remain a neutral site. [Middark] The keep is swarmed by goblins from outside and duergar and mummy-like skeletal creatures from underground. The PCs and militia prove victorious, at the cost of three more soldiers slain, and two others maimed. 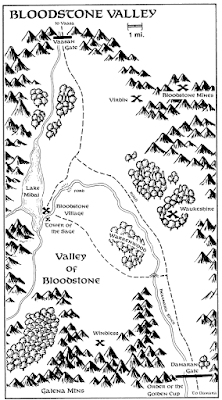 Bloodstone Valley and Bloodstone Pass are the only passable route between the countries of Vaasa and Damara, known collectively as the Bloodstone Lands. The commission from Lord Daleamber is considered "divided" to your sheets, so not listed. We should figure out who's carrying what at the beginning of the next game. [Midmorning] The party enters the keep's front entrance through a broken portcullis, bypasses a flying-blade trap in the main entryway, and defeats a gargoyle in an inner courtyard. [Highsun] The upper levels of the keep are scoured, and the party encounters a ranger from Vaasa named Aazen who claims himself a delver of the Underdark. Aazen explains that goblins and the Burning Hand orcs are active in the area, and that Windless could be in danger. [Fullday] The five encounter and defeat goblins in the keep's dungeon level; Dravin is badly wounded. [Sunset] The PCs rest in one of the keep's front towers, while Aazen spends the night exploring the grounds nearby. [Middark] Goblins are heard fighting with orcs in the direction of the mountains, far off. [Sunrise] The party exits the keep and departs for Windless; Aazen elects to stay behind. [Afternoon] The party returns to Windless and consults with Lord Daleamber. A meeting is called for later in the evening. Late autumn; temperatures are cold; only occasional snowfall. Two hunters are found slain along the road to Frostmar Keep. [Fullday] Dravin, Arannis, Bree, and Laise gain the audience of Lord Rorovan Daleamber and inquire about the killings, agreeing to a bounty of two hundred gold pieces to determine the source of the attack. [Afternoon] Arannis speaks to Mirta, sister to one of the felled hunters. [Evening] The party speaks to Adwyn Elmshadow, a ranger of Windless. [Sunrise] The party sets out from the gates of Windless on the road that leads to Frostmar Keep. [Evening] As the party sets up camp, the companions are assaulted by (and defeat) a small band of kobolds accompanied by an ogre. [Middark] Arannis spots a hundred red eyes while resting; after waking the others, the four continue along the road. [Sunrise] The party arrives on the grounds of Frostmar Keep and notices several pairs of clawed footprints in the snow.